Er, well, Swann's, Swann's, there's this nursery, there's this nursery, and er, it's in the morning, it's in the morning -- no, it's lunchtime, in the lunchtime and er, there's a garden and er, these blokes come in -- blokes come in -- what's their names? -- what's their names? Andy and Ed -- for those are their names -- are heading Swann's Way. Past Five Winds, past the British Larder (one day, maybe), then a cheeky left. Before Eyke comes Bromeswell, and praise be, there's a sign: CAFE. Down the track to park outside Swann's Nursery, "local experts for plants". We ain't here for greenery; we're here for grub. Cafe sign seems to point within that tent of Christmas goodies -- brief visions of sitting under a sheet of soggy polythene -- but no, it's round the back. 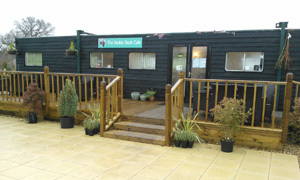 There, in its standalone portacabin home, sits the Ruddy Duck Cafe. Outside seating would be delightful if it wasn't early December and a really filthy day. Push door and proceed for warmth and welcome. Counter and kitchen to the right, proper wooden tables -- with cushions, mind -- and some comfy seating to the left, and a Christmas tree dead ahead. Naw. Specials all round from the lovely ladies: pumpkin and red pepper soup for the driver, turkey & stuffing bap for the passenger. 'Tis the season, innit. On our table sits a carved wooden duck named Ida. Quick scan of today's EADT and behold our well-presented platters, mine with added coleslaw, crisps and, note, some dressed side salad. Thumbs very much aloft. Clear that these ladies take pride in the produce. Back for a large macchiato, and let's pause there. Imagine, a posh coffee, very good too, near Eyke! Wow. Plus a slab of millionaires' shortbread, since it's nearly Friday. For Andy, the mocha and choc cake, 'cos he needs building up. Best garden centre caff by a country mile. I ruddy love this place. If it was a car -- DUKW. If they were passing by -- Joe Gilgun.